Right after I topped off the icefall I found myself on a nice flat glacier and entered the Western Cwm. The word cwm had annoyed me for a long time. How the hell do you pronounce it, what does it mean? It turns out that it’s a Welsh word pronounced ‘coom’, and a cwm is a glaciated valley surrounded on three sides. 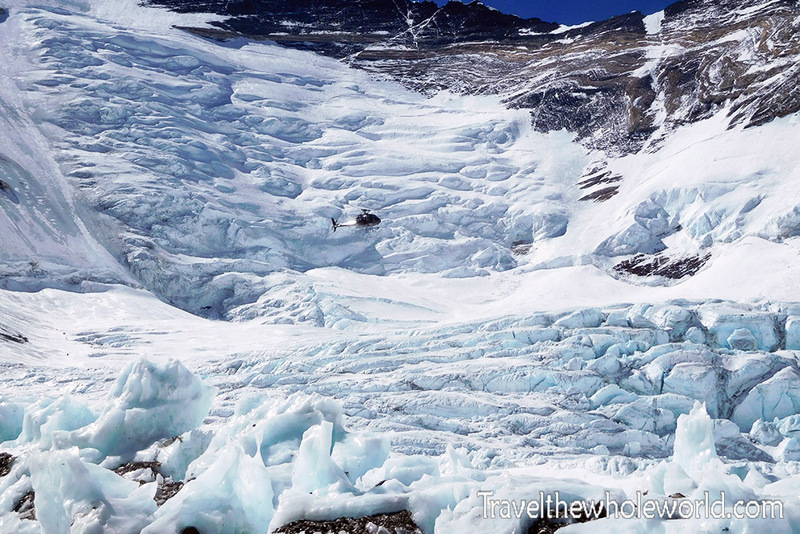 Once you get on top of the icefall, you have Mt. 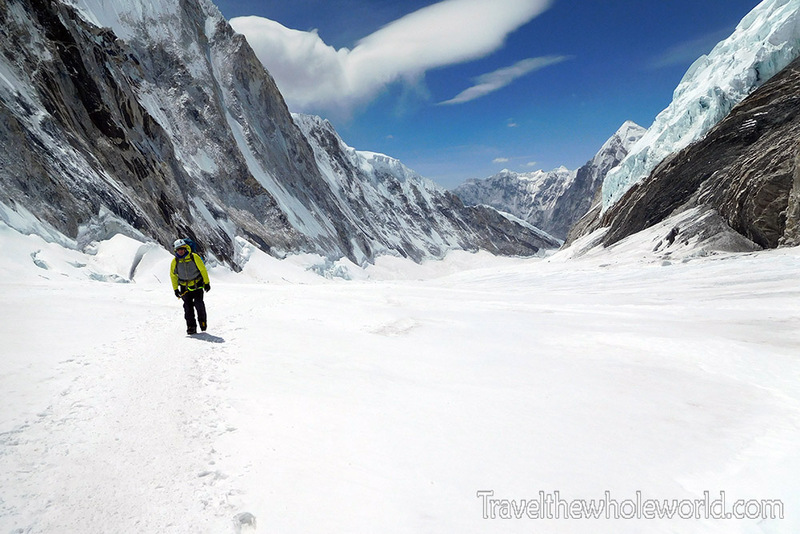 Everest to your left, Lhotse straight ahead, and Nuptse to your right forming the three walls of the valley. 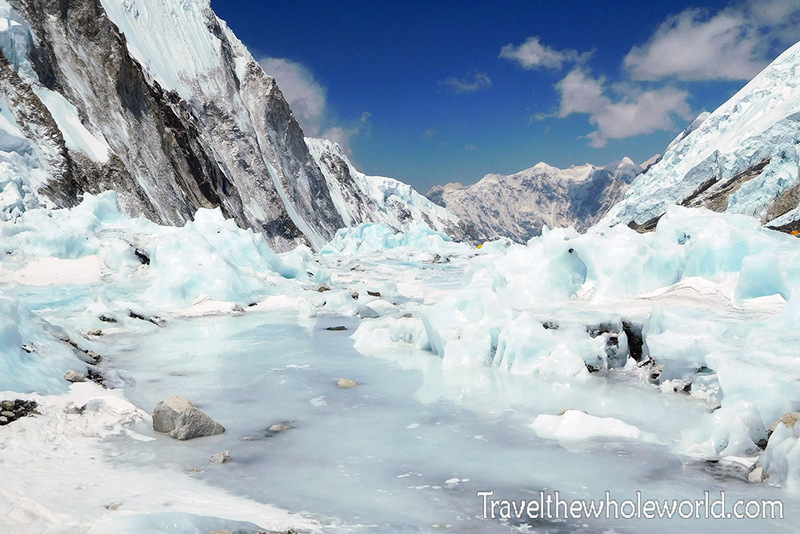 The photo above I took only a few minutes after leaving the icefall, what a change! 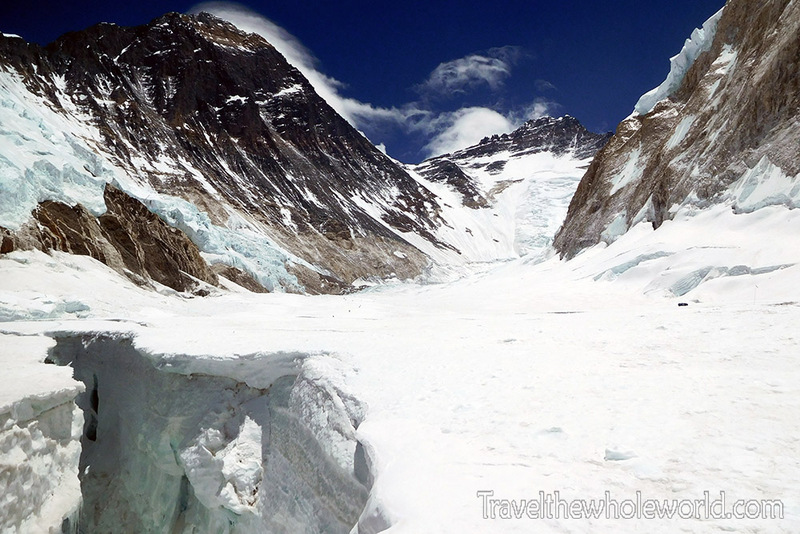 After reaching the top of the icefall it only took about an hour to reach Camp I. The first time I arrived to Camp I I was pretty tired. At 20,000 feet (6,100+ meters), this was highest I had gone so far on this trip. 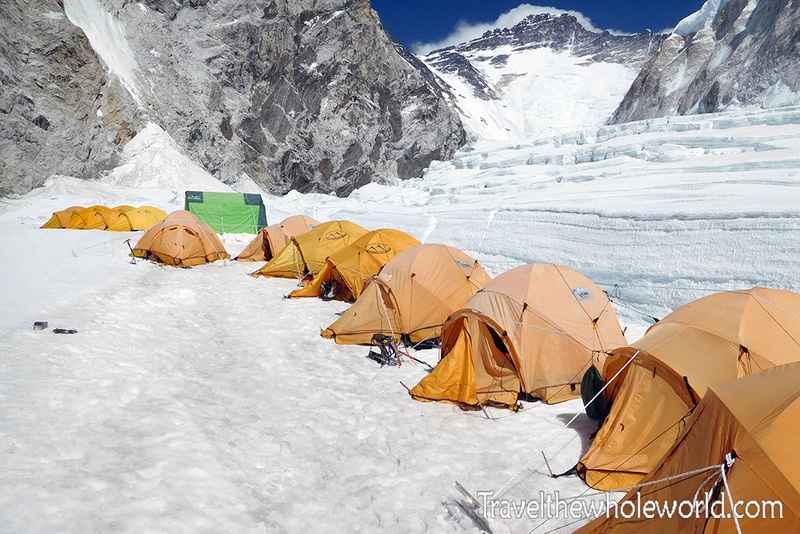 The photo above shows my expedition’s tents lined up nicely in the middle of the valley. Camp I isn’t in the safest of locations. 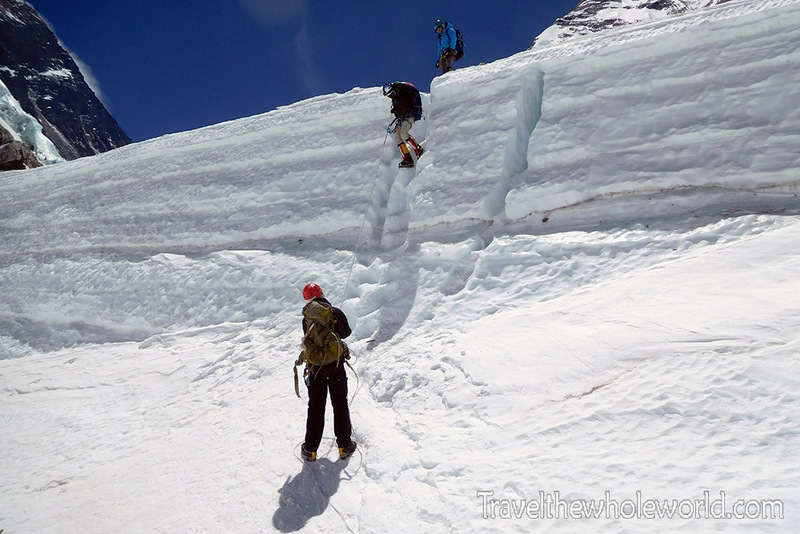 There is a reasonably high avalanche risk here and lots of crevasses that can still open up. Almost every time I passed through this valley I saw an avalanche. One of the most dramatic ones that I saw was when I was going home for the final time. I was alone in the Western Cwm and the avalanche was so huge that it swept down the Nuptse side of the mountain and blew a giant cloud of snow across the entire valley. I was so sure that I had it on video but when I came home I was extremely disappointed to see I somehow hadn’t captured it on my GoPro! This second photo shows a shot of Camp I from a distance after I was heading up to Camp II. I spent two nights in Camp I the first time I arrived here. Since I was well acclimatized the next time I went through the icefall, I actually skipped Camp I and went directly to Camp II. On the way down almost everyone goes directly from Camp II to base camp. Immediately leaving Camp I you’ll have to cross several crevasses and even climb a few short, but annoying walls. 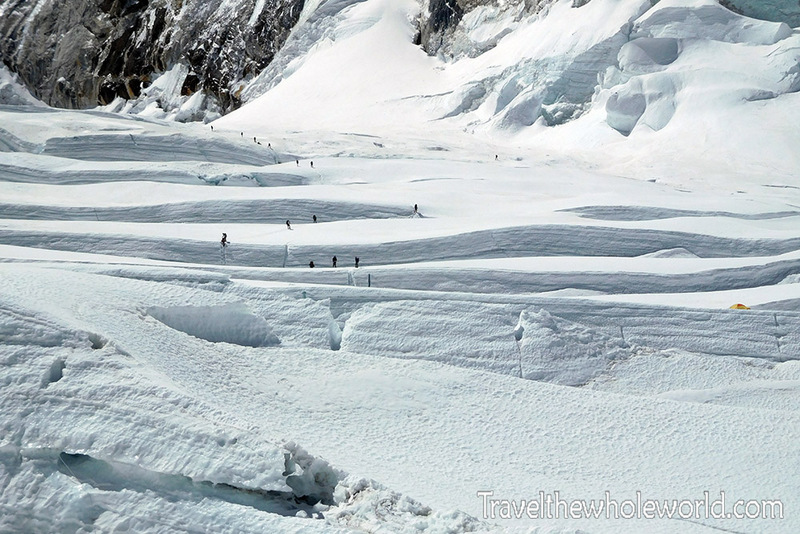 Above is a shot immediately after Camp I and you can see some of the crevasses that have to be climbed. There’s actually a lot of horizontal ladders to be crossed here. 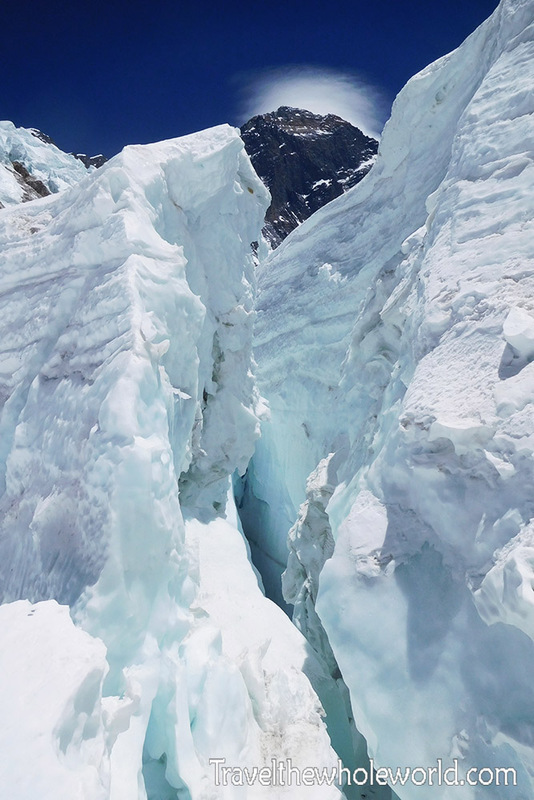 Below is a photo of a nasty crevasse I took right outside of Camp I. All of the walls in the Western Cwm are very short, like this one above. By the time it was the end of the season, so many people had kicked steps into the walls that you could just walk down them. Some others were easier and even fun to rappel down. 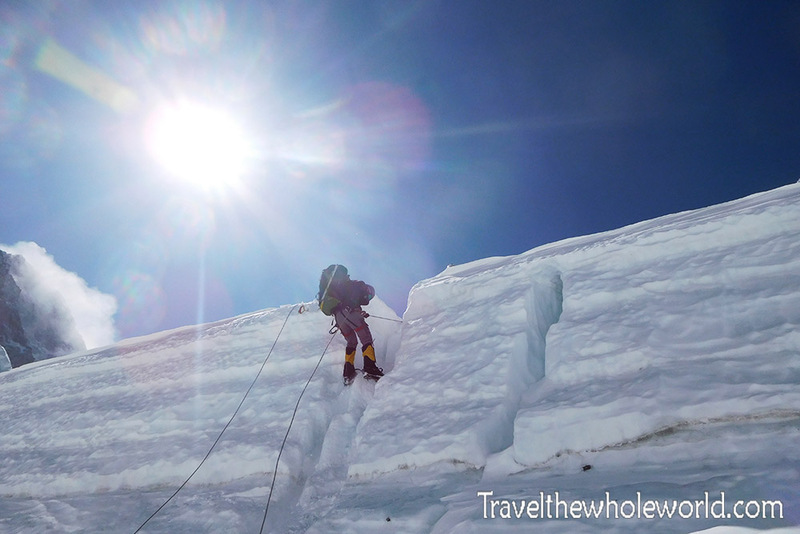 The photo below shows me rappelling down a section in the Western Cwm as I headed back to Base Camp. At Camp I Mt. Everest still isn’t visible, and it wasn’t until I was halfway through the Western Cwm that I finally thought to look up ahead. When I did I took this shot above, of the entire Western Cwm and the summit of Everest on the left! As I got closer the views only got better, and I later took the photo below. For the very first time in my life I had a very clear sight of the top of the world! It was incredibly exciting to finally see it. 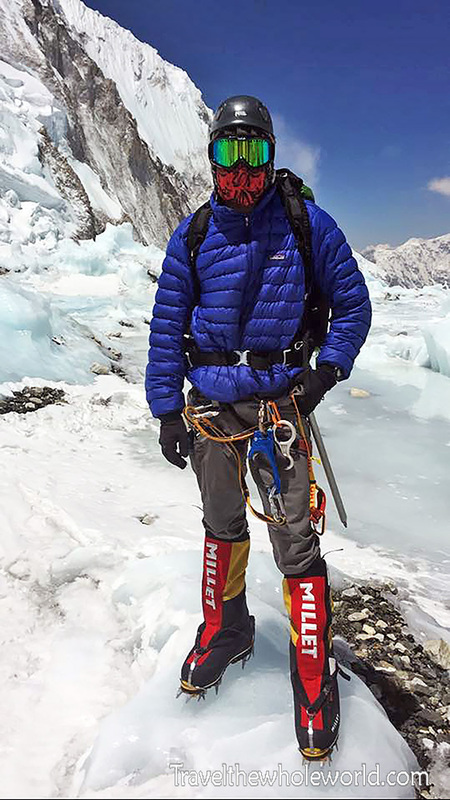 At my current elevation I was probably close to 21,000 feet (6,300 meters) and was now roughly 8,000 vertical feet (2,500 meters) from the top of Everest. Even though the most exciting and amazing views were ahead of me, it’s still important to turn around and not forget what’s behind you. This photo above shows one of our members in the expedition who I met up with in the Western Cwm. About a quarter through the Western Cwm you’ll finish with the crevasses and then just have a nice snowy slope all the way to Camp II. It wasn’t too hard to get to Camp II the first time. The real issue was finding our tents. Camp II is pretty spread out, and my expedition had set it up at one of the highest areas. Once we arrived to the edge of camp II it took us another grueling 30 minutes up rocky terrain to find our tents. 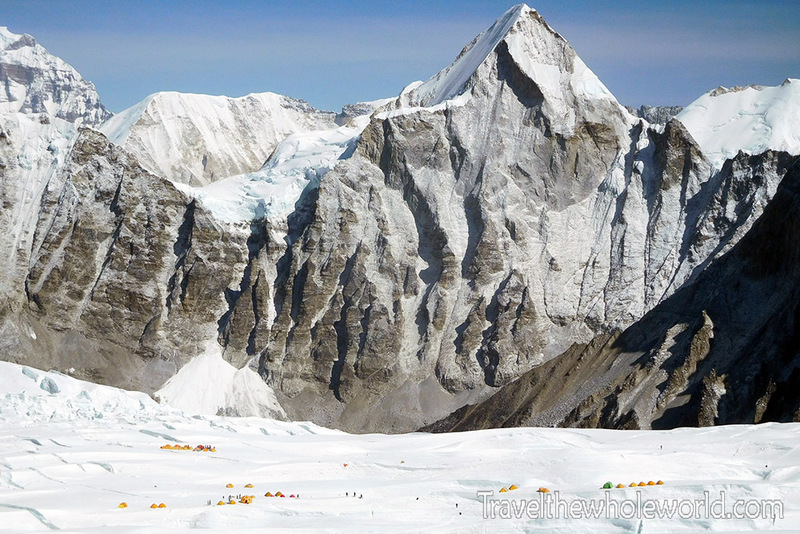 We spent more time at Camp II than anywhere else on the mountain other than Base Camp of course. For that reason, Camp II is often called Advanced Base Camp or the ABC. 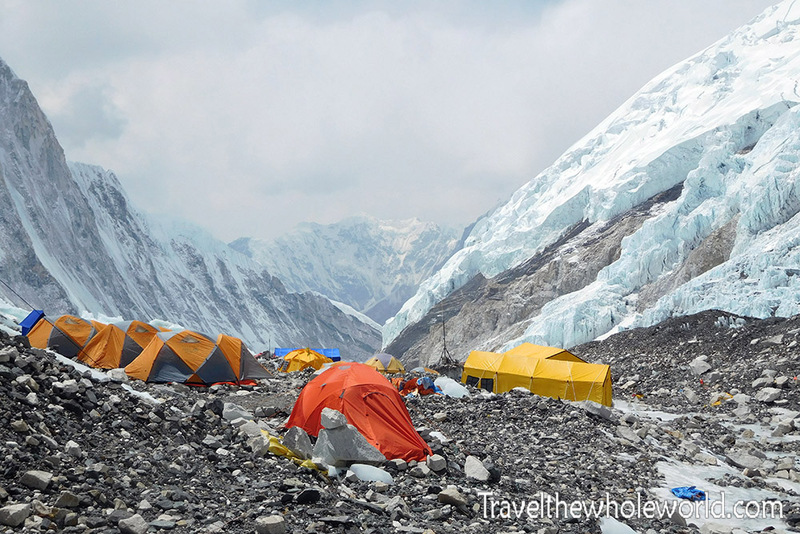 Located at 21,500 feet (6,400 meters), it’s high enough to keep you close to the Lhotse Face and at an altitude that you can safely spend a long time. The great thing about ABC is that you’re out of harms way from avalanches and other risks. Camp II is also the highest place you can reasonably expect to see a helicopter, like the one photographed above. In very extreme cases, a helicopter may attempt to go higher, but it’s very risky. Because the air is so thin, it’s difficult to support the flight and in these circumstances they’ll have to remove the doors, seats, and anything else that isn’t essential. Whenever the pilots fly to Camp II it’s generally an emergency. The pilots themselves will be wearing a down suit and breathing oxygen. My last photo is of my favorite part of the Western Cwm. There was a beautiful area just outside of Camp II that changed from snow to this icy area. When the sun comes out, it’s so intense that sometimes there is even a little pool of water here despite how high we were! 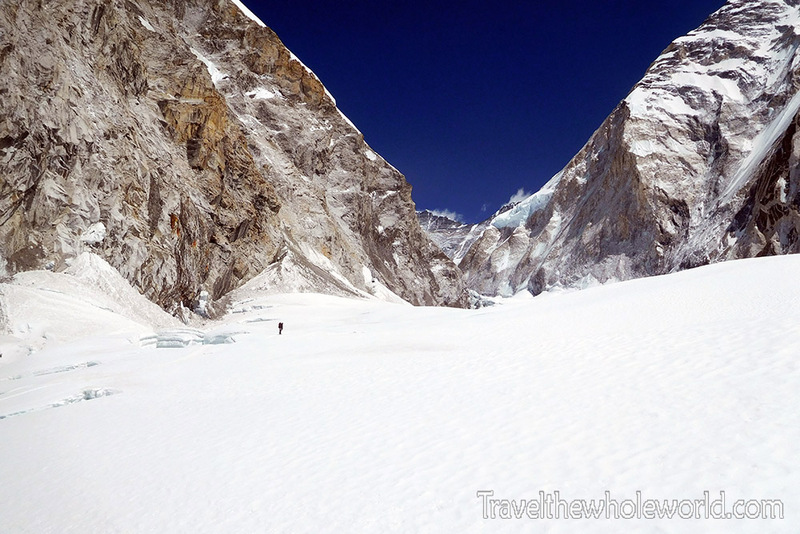 This is an area that many use as a crampon point before beginning their way up the Lhotse Face. It’s a nice place to sit down and have a water break and take in the scenery as well. Below is a photo someone took of me after I threw my crampons on. With the sun so strong and all that snow and ice to reflect off everything I made sure I was completely covered up! 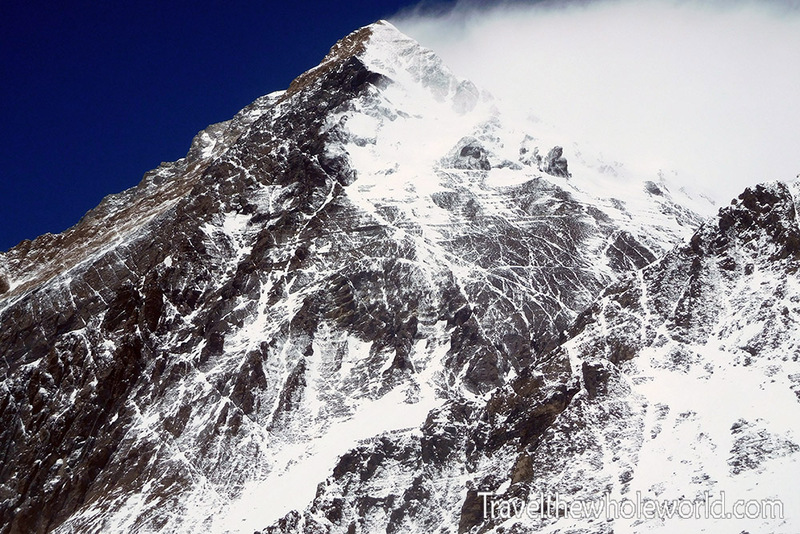 Click here to see the Lhotse Face!